Product prices and availability are accurate as of 2019-04-17 22:47:53 UTC and are subject to change. Any price and availability information displayed on http://www.amazon.com/ at the time of purchase will apply to the purchase of this product. 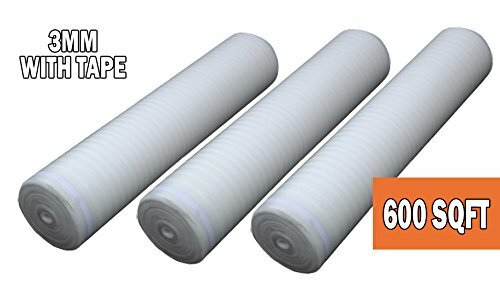 600Sqft AMERIQUE 4/32 inches 3mm thick flooring underlayment padding with tape 3-in-1 heavy duty foam, 200Sf/roll this listing is for 3 roll 200Sqft AMERIQUE 3mm thick White underlayment padding with tape mold and moisture protection, non allergenic, 3mm closed foam technology for sound reduction anti-crush technology for excellent performance & long life perfect for wood, bamboo and laminate floors easy installation with self adhesive strip.